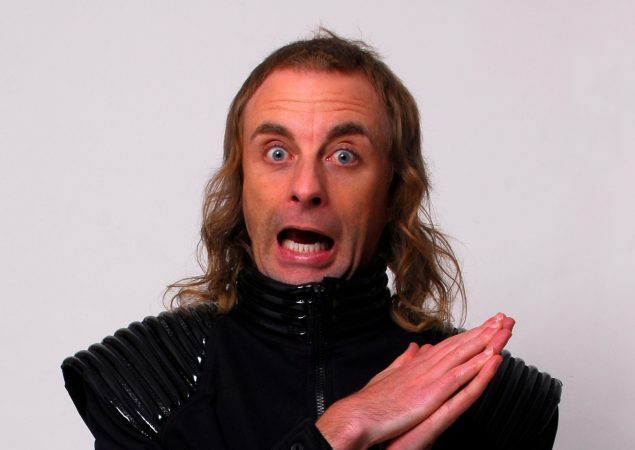 Paul Foot returned to this year’s Bristol Comedy Garden with his new “popular gameshow”, Game of Dangers. As a sideline from his normal stand-up, Game of Dangers invites two comedians and two members of the audience onto the stage to take part in a quiz based on danger, death and intriguing incidences in history. The show starts in typical Paul Foot fashion, the eccentric and much-loved man with one of the worlds strangest haircuts, as he roams the crowd attempting to explain the foundations for the game while simultaneously making certain people incredibly uncomfortable by stroking them and talking much too close to their faces. As he stares intently at one audience member, he explains that he “will be addressing this man too close and for too long”. This is standard Foot-ery, and it is much appreciated by the crowd. He has a fantastic, obscure and endearing way of describing people – a woman in the front row is noted for having “such a lovely jaw face”, and another for having “such lovely shoulder bone structure”. Further back in the crowd another woman “looks like she could be a former civil servant”, while a man to the left of the stage is a “possible homosexual – worth checking”. The man strokes Foot’s hair in an entirely unerotic way, putting to bed any notions of latent gay feelings. Following the improvised opening, Foot introduces the two guest comedians Fin Taylor and Stephen K Amos, who choose their partners from the audience. Taylor chooses Gruff, a man in a “pork pie hat”, chosen because “the taller the hat the more confident the person”. Amos plugs for Annabelle, renamed Denis, although the reason for the alias is lost somewhere along the line. Game of Dangers proceeds with questions about skydiving escapes, frozen turds and mountaineers wearing the wrong underwear. Much of the success of the show rests on the quality of the guests. Taylor is good value, noting dryly that Stokes Croft “is where people dress up and call it subculture”, while another joke about terminally ill people swimming with dolphins “misjudges the room”. Unfortunately Amos is less suited to the format, his loud butting in not quite fitting the mood of the show, leaving the audience wishing they could hear more of Foot. Foot ends the show by providing Annabelle with one of the least sensual lapdances you are ever likely to see. Game of Dangers provides decent enough entertainment, and will satisfy Foot’s devoted fans. It stands or falls on the guests’ contributions, and in this instance they came second to Foot, leaving a desire to see more of his excellent solo stand-up work.